Kai Mayberger puts a handmade cherrywood flute to his lips and breathes a meditative Asian tune. For a moment, the dark, soothing room takes flight from its earthly station in Bridgewater Corners and travels back 1000 years to some exotic, Far East land. Then he puts the flute down and reality reigns again. Outside, tractor-trailers rumble along Route 4. Inside, Mayberger, a 42-year-old from the Northeast Kingdom, runs a hand through his wavy gray hair and insists that he’s not a musician but a woodworker. Actually, he’s both. Doing business as White Raven Drum Works, Mayberger has been making drums, flutes and didgeridoos here since 1993. He’s quietly gained a reputation in the United States and Europe for crafting instruments that sound as pretty as they look. The latest evidence of that growing rep is an invitation to occupy a retail space at Dollywood — Dolly Parton’s amusement park in Pigeon Forge, Tenn. — for the Festival of Nations, a monthlong celebration of music and dance in April showcasing percussionists from around the world. Mayberger doesn’t like to hawk his wares from a tent — he attends just one outdoor show a year — but Dollywood will attract 250,000 people in April, and they offered him a storefront, not an E-Z UP. Plus, they asked nicely. “If it had been an email, I would have deleted it immediately,” he says, “but a really nice, personable human being called me.” He leaves at the end of this month. Mayberger has the personal history you might expect from someone who makes wooden instruments. Music runs in the family — his grandfather played for the Boston Pops. And he’s been hacking up his fingers carving wood since he was 4 years old. “I lost more jackknives before the age of 8 than most people have owned,” he says. He refined his skills by working with his uncle, a boatbuilder and finish carpenter, while he was in high school. After a few years spent building kitchens in Florida and framing homes in Vermont, Mayberger decided college was the next step. At 21 he was accepted at Goddard College, and used his senior study to design a drum-making business. He had built a few frame drums over the years and learned that in the ancient tradition of shamanism, drums were employed as a sort of vibrational medicine. The marriage of form and function embodied in a drum appealed to Mayberger very much, and his path was set. He first focused on the ashiko drum, a cone-shaped instrument with a single head made from animal skin. Originally from North Africa, it has a deep resonance in the center and a tinnier pop on the edges. A drum maker can tweak the sound by using a different hide — Mayberger uses moose, which is thicker and produces a deeper sound than that of deer — and changing the size of the drum. The bigger the drum, the deeper the resonance. Big ashikos have a thunderous roar, which enabled their use in the “jungle telegraph” in Africa, where messages would be drummed from one tribe to the next. Mayberger also sells djembes, which are rounder than ashikos. He imports them from West Africa, where they’re made from a single block of wood. Next to the aesthetic African drums in his gallery are a couple of plain-looking rectangular wooden boxes. But these aren’t for storage; they’re cajóns. Made of plywood, they have guitar strings affixed against the inside of one surface and a sound hole on another surface. Play it on the side with the strings and it buzzes and rattles, much like a snare. Play it on another side and it sounds simply percussive. As a way to celebrate the end of college, Mayberger tried his hand at flute making. He took a trip to the Four Corners region in the American Southwest and saw a variety of flutes selling for $90. He wasn’t impressed. What a deal it is, then, to pay $125 for a flute that gives you five or even six notes, as Mayberger’s do. Carved into shapes of bird beaks and made from rich, colorful woods such as ebony and beech, the flutes beg to be picked up and played. In a rounded corner on the other side of the gallery is an assortment of didgeridoos. From afar they look like giant chopsticks — skinny on top and wider at the bottom. The instrument has been discovered in different pockets of the world, but it’s believed that indigenous Australians first developed them thousands of years ago. Traditionally, didgeridoos were made from eucalyptus trees hollowed out by termites, but these days people make them from almost any type of wood. Mayberger uses a variety of local woods, but also cultivates mango and pheasant wood trees in Florida just for making didgeridoos. And, like most modern builders, he doesn’t bother with finding the perfectly hollowed dead tree; Mayberger glues strips of wood together into a 16-sided sphere and sands it down to a circle. 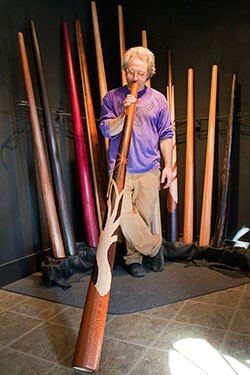 As it turns out, playing the didgeridoo strengthens the muscles of the soft palate. If you suffer from sleep apnea, those muscles collapse while you’re slumbering and block your breathing passage, sometimes causing asphyxiation. A 2005 study published in the British Medical Journal demonstrated that playing the didgeridoo for 20 minutes before going to bed is an effective alternative cure, aside from surgery, for the disorder. Playing this instrument presents a unique challenge, as compared to playing a drum. Playing it for more than 20 seconds straight requires learning circular breathing, a technique by which players inhale through the nose and exhale through the mouth simultaneously, using air stored in the cheeks to produce uninterrupted tones. Mayberger offers lessons, free of charge.